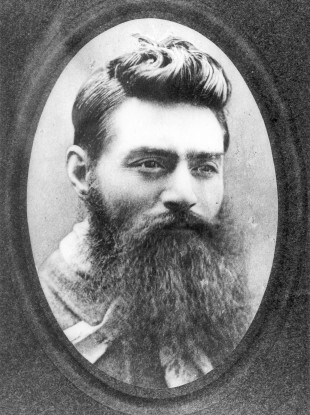 Ned Kelly was hanged for his part in the murder of three policeman in 1880. Mystery surrounds the disappearance of his skull. Ned Kelly in a photo taken at the Old Melbourne Jail on the day before he was hanged on 11 November 1880. THE REMAINS OF the infamous Irish-Australian outcast Ned Kelly have been identified 131 years after he was hanged for murder and his body was later buried in a mass grave at a jail in Melbourne. Scientists have used DNA from Kelly’s great great nephew to determine the identity of the bushrangers’ bones from others in the mass grave but the location of his skull is not known, having reportedly sat on the desk of a Victorian state police detective in 1929, according to Reuters. An iconic figure in Australian history, Kelly typified the social tensions in Australia between poor Irish settlers and the wealthy establishment at the time he and his criminal gang operated. Kelly’s most serious crime was his involvement in the murder of three policeman in 1878 after which his gang was outlawed. He was sentenced to death by hanging at the Old Melbourne Jail in November 1880. Having initially been buried at the jail, his remains and those of other executed inmates were exhumed and reburied in a mass grave at the newer Pentridge Prison in 1929, alongside 33 others. Officials pinpointed the location of the grave site in 2008 and later exhumed the bodies for analysis. A DNA sample confirmed that one of the skeletons — which was missing most of its skull — was that of the notorious Ned, said Victoria Attorney General Robert Clark. “To think a group of scientists could identify the body of a man who was executed more than 130 years ago, moved and buried in a haphazard fashion among 33 other prisoners, most of whom are not identified, is amazing,” Clark said in a statement. Mystery has long surrounded the whereabouts of his skull which it is thought may have become separated from the rest of his body during the move to Pentridge in 1929. According to The Telegraph, the skull was reported in 1979 to have been stolen from the old jail. In 2009, a farmer handed a skull with the inscription ‘E. Kelly’ in to the Victorian Institute of Forensic Medicine. Although believed at the time to be the skull of Kelly, the latest identification of the rest of his body has discounted the skull, meaning the mystery goes on. Born to Irish parents John ‘Red’ Kelly and his wife Ellen in 1855, Ned was first arrested at aged 14 and served seven weeks in jail for the assault of a Chinese pig farmer, the Herald Sun reports. A year later he was jailed again for three years for assaulting a hawker and being in possession of a stolen horse. In 1878, he is alleged to have shot police constable Alexander Fitzpatrick in the wrist after he became too friendly with his sister Kate. Kelly’s mother was jailed after the officer gave an inaccurate report. Fearing he wouldn’t be believed, Kelly went into hiding with his brother Dan but was found at Stringybark Creek and in a shootout, three policemen were killed. Declared as outlaws and with a reward of £500 offered for each of the gang members dead or alive, Kelly’s gang went on a crime spree, robbing major banks and leaving a famous letter in which he outlined the ill-treatment of his family and Irish Catholics. Later the gang wore famous metal plated armour in their final years as they carried out a series of robberies and hostage takings. In June 1880 every single gang member except Kelly was killed in a shootout which lasted half a day. A badly wounded Kelly was taken into custody and later hanged at the Old Melbourne Jail, his last words at the time were reported to be: “Such is life”. Email “Remains of infamous Irish-Australian outlaw identified... but no sign of his skull”. Feedback on “Remains of infamous Irish-Australian outlaw identified... but no sign of his skull”.